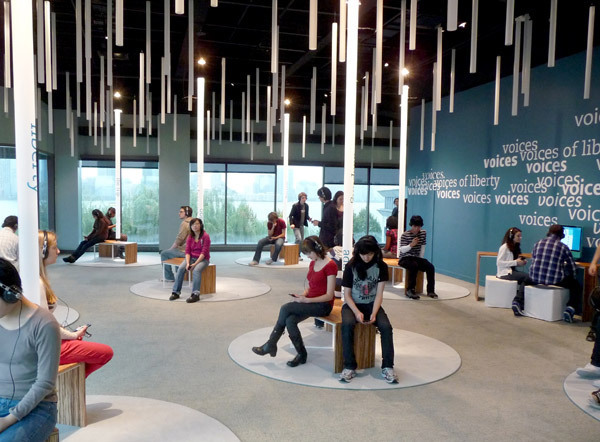 The firm's Voices of Liberty installation at the Museum of Jewish Heritage has just won a MUSE award, the museum technology award from the American Association of Museums (AAM) . Voices of Liberty was also a 2010 finalist for the International Design Excellence Award (IDEA) of the Industrial Design Society of America. It will be noted in the 2010 Innovation Yearbook of Industrial Design Excellence and in the IDEA Galleries online. Read project summaries about the exhibit and the corresponding website and kiosk , as well as past Fresh posts about the project. The Voices of Liberty project was led by partner Jonathan Alger , with partner Emanuela Frigerio leading graphic design and associate partner Maya Kopytman leading the web portion of the project. The project was created in collaboration with technology design firm Potion .